Westin Run X Standard Chartered Marathon 2018 | JustRunLah! 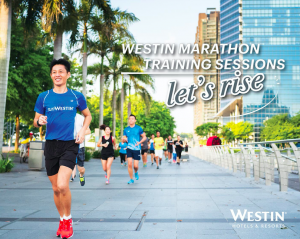 Westin Hotels & Resorts owned by Marriott International has established the Westin Team and welcomes all to join them to run Singapore Standard Chartered Marathon now. Runners who apply to join the Westin Team and successfully register as Starwood Preferred Guest (SPG) member will have the chance to gain access to run the Marathon. Westin Team member will gain access to run the Marathon and receive an exclusive race bag provided by Westin Hotels & Resorts.